Find the classes you need. Search for Sections in WebAdvisor is updated regularly to provide you with the most up-to-date class schedule information. 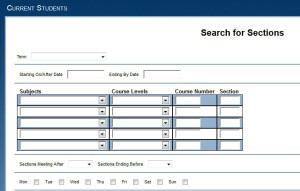 Current students can also View Course Offerings or Search and Register for Classes in MyNIACC. To find online courses only change the Location to “Web-Based Instruction”. Click any of the following class schedules to download the pdf for a list of classes offered. You can save it to your computer by going to “File” and clicking “Save as”.